Does it matter when you pin on Pinterest? Did you know that there is an optimal time to pin your content on Pinterest? In this blog post, I’m sharing how to find your optimal times to pin as well as why it matters with the Smart Feed and new Following Tab on Pinterest. When is the best time to pin? Back before Pinterest had the smart feed, pins appeared in chronological order. Meaning, as the pins were pinned by the content creator, the user saw the pin live in their feed. Now, with the Smart Feed and the new introduction of the Following Tab, pinning at optimal times matters more. In general, the best times to pin live are in the evening and on weekends in the U.S. This means, if you are a Pinterest marketer living abroad and particularly east, but hoping to reach U.S audiences, then you’d be pinning in the middle of the night. Not super functional right? The Smart Feed, though not exclusively chronological, does show your content to your followers as it is pinned. If your followers engage with your pin, Pinterest will show it to 10x more pinners who engage with related interests. With the new Following Tab, if pinners are on in the evening, then it absolutely does affect when pins are pinned either live manually or scheduled through a scheduler (I love Tailwind—here’s my affiliate link!). So, what’s the best strategy? The best strategy is to stay consistent pinning on Pinterest. Don’t try to pin 50 pins one day and then ignore the platform the rest of the week. Pinterest prefers regular, consistent use of the platform. With Tailwind, simply choose your time zone and Tailwind will tell you which time slots are optimal (green). Of course, you can add more or use an ‘exact’ schedule, but this feature makes it easy for Tailwind users to optimize their content. Lastly, if you are using Tailwind to decide the best times to pin your content, it also absolutely helps you stay consistent during those most popular times. 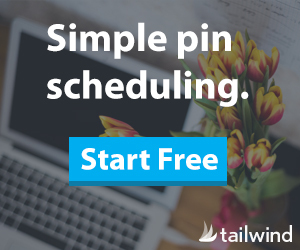 By using the smart schedule and the Tailwind queue, you can ensure that your content is regularly pinning to Pinterest on auto-pilot! Busy entrepreneurs: All the high fives, right?! With a half-life of over 3.5 months (take that Instagram and Twitter), Pinterest pins have the exponential power to inspire Pinterest users to take action on your pins well beyond when you pin it, but by pinning at optimal times, you’ll have greater reach and more traffic to your site! « What is Pinterest’s New Following Tab?